This also is connected to things going on in our pilot in OLPC Israel. I won't get in to it in this post, because Netzach and I are going to write a report about it regarding a pilot we are doing with 9 Bedouin kids in the Ilan Ramon Youth Physics Center. If you are wondering if this actually worked fully on the Nokia (unlike people who claim Android worked there, and it's just the x86 emulator). Well, it did pretty much work. However it was slow, and you wont get the browser working on it with 128MB ram. However I did get avahi-daemon working (remember to turn it on). Then I got in to the Chat system, and I could share things, etc. You might need to enlarge the easy chroot iso image, so you have space to install sugar. I also guess that if someone installs it on Mer (an Ubuntu-based distro for the Nokia), it might even work faster. 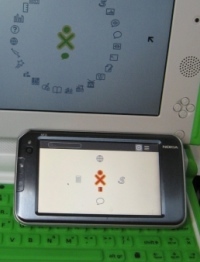 Guysoft originally posted this as Nokia N810 Running OLPC Sugar and its republished here with his permission.